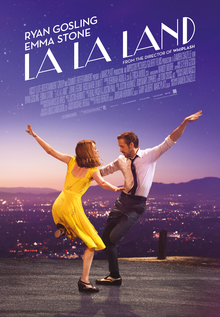 La La Land, written and directed by Damien Chazelle has achieved enormous critical and commercial success. How and why is a mystery to me. For a musical, it has no memorable songs, with the exception of “City of Stars,” which I quickly forgot ten minutes after leaving the theater. And that big opening dance number? It was okay, but I can name production numbers from a dozen movie musicals from the 1950s that would put it to shame. The movie is about an aspiring actress (Emma Stone) and musician (Ryan Gosling). The two meet by chance and fall in love in Los Angeles. Stone works at a coffee shop on the Warner Brothers lot, going to auditions in between making lattes. When we meet Gosling, he’s playing piano at a restaurant, but yearning to open a jazz club. Eventually both achieve their career goals, but travel down different paths in the process. One thing that La La Land has going for it is Stone and Gosling, two very appealing performers. Both are likeable and believable and work well together. Neither can really sing nor dance, although I found their singing pleasant enough. The plot isn’t particularly original, but there are really no original plots anymore and some of the best musicals are very thin in that area anyway. The movie opens with a partial image of the Cinemascope logo in black and white in the old Academy film ratio. The screen eventually expands to reveal the complete logo in color. The film was shot in Panavision, but the credits say “presented in Cinemascope” with the logo from that old widescreen process. Cinemascope was developed in 1953 and abandoned in 1967 for the aforementioned Panavision. Not sure what Chazelle was going for with this allusion (at one point Stone and Gosling go to see a screening of Rebel Without a Cause, which was shot in Cinemascope), but he does a good job making Los Angeles look beautiful and intriguing. As a movie musical it’s pretty weak. Like I already mentioned, the songs aren’t memorable. The choreography, with the exception of the opening number is pretty bland. There’s no ease or naturalness to Stone and Gosling as a dancing couple. I mean, they dance like a couple who met at a wedding. Good enough for a waltz or two, but a movie musical? And that opening number was fun, but was it really dancing? It seemed more like a cheerleading competition—not that there’s anything wrong with that—than a true dance routine. La La Land wasn’t boring or the worst movie I’ve ever seen, but a groundbreaking musical it’s not.